ECOLISE is developing this new framework for collaborative production, sharing and implementation of knowledge. Integrating formal and informal modes of inquiry, documentation and evaluation, it is intended to be a tool to support and strengthen ongoing processes of action learning that lie at the heart of community-led action. For ECOLISE, it recognises the central role of knowledge and learning in our work and that of our members, as both networks and organisations, and seeks to support the relationships between Knowledge and Learning and the other key ECOLISE pillars of Communications and Policy. Operating in a federated fashion and based on open source platforms and working processes, it aims to meet the needs of diverse users and user groups throughout ECOLISE and wider allied networks. The Knowledge Commons includes technical and social components: an #Information archive and #User community. The information archive covers five main thematic areas: research, education, practice, mapping and media. In each of these areas, it combines technical platforms for the compilation, curation and generation of information at three successively more abstract levels: data, documents and patterns. Patterns synthesise the current state of knowledge on any topic, whether of greater or lesser scope, as multi-authored, mobile and dynamic information artefacts. The creation, application, evaluation and ongoing revision of patterns is envisaged to be the heart of the collaborative knowledge production processes undertaken by the user community. The user community operates and maintains the knowledge commons via an agreed set of #Rules-in-use. These rules identify the rights and associated responsibilities of different users, describe how such rights are acquired and lost, and specify procedures for ensuring responsibilities are maintained and introducing appropriate sanctions when they are not. Users may potentially include anyone involved in or allied with ECOLISE able to benefit from and in some way contribute to the information archive (bearing in mind that usage alone constitutes a form of contribution). The ability to federate knowledge – to duplicate and separately modify fragments of the information archive, and selectively incorporate useful changes back into the main archive – allows user groups to work with autonomously, and the archive itself to capture a wide range of collective wisdom. A key challenge for ECOLISE and many of its member organisations and networks is mobilising suitable evidence to help improve practice, inform strategic decisions, justify applications for funding and other support, and make a robust case for policy interventions. The existing evidence base is substantial, but highly fragmented and partial, much of it in forms that are not visible, available and/or accessible to practitioners and supporting organisations. No thorough overview of relevant information exists, nor are research and reporting efforts coordinated or integrated in any meaningful fashion. The contributions of research to practice are therefore haphazard at best. The overall research effort and levels of resourcing are tiny relative to the scale and importance of the subject area, and in the absence of any strategic coordination not leveraged to their full potential. ECOLISE member organisations have made various efforts to address this situation, most notably development and implementation of the Research Strategy of the Permaculture Association (Britain) (leading to establishment of the Permaculture International Research Network), and establishment of the Transition Research Network (TRN) and GEN’s Ecovillage Research Working Group. All of these initiatives have been so far constrained by scarce and precarious access to funding and other resources. They share an understanding that all these movements operate as action learning networks: learning, monitoring and evaluation processes of varying degrees of formality are intrinsic to practice at all levels, and can exist in mutually enhancing relationships with more centralised and/or formal research. Each has developed in its own way, acquiring a particular set of insights, strengths and competences as well as weaknesses and unexplored areas. The knowledge commons will serve to support, interconnect, integrate and harness synergies among these diverse efforts, and with relevant formal research. It will provide a shared platform for collaboration at all stages in the research cycle: problem definition, survey of existing knowledge, project conception and development, data gathering, analysis, interpretation, dissemination and overall reflection/evaluation. It will provide both technical resources and enhanced social and cultural capacity for such collaboration, within, across and beyond our member organisations and networks. A model for this effect drawn from nature is the process of endosymbiosis, through which several kinds of bacterial cell, having evolved in different ways, successively merged to form the first eukaryote cells. The emergent properties of this more complex cell type allowed it to become the basis of new forms of life, including the ancestors of all multicellular organisms, i.e. all animals, plants and fungi, including humans (Figure 1). The knowledge commons is intended to support a similar process of emergence among currently dispersed efforts at linking research and practical action, opening new possibilities beyond what has been achievable, perhaps even imaginable, until now. 3. A defined #user community of users and curators who maintain the archive, determine and enforce the rules-in-use, monitor their outcomes, and on the basis of this adapt both the archive itself and the rules in use in ongoing fashion. A knowledge commons additionally includes the wider field of deployment of this information in practical action. In the case of ECOLISE this consists of the ongoing work of member organisations, projects and initiatives. The curator community is a subset of this user community, mandated by this community to hold defined rights that allow them to exercise specific responsibilities in relation to governance and decision-making. The key concern at this point is design of the information archive. Treating current internal projects (production of a Summary Report and Status Report) as a rapid prototype of this provides an opportunity to help reconcile short-term priorities for timely delivery with the creation of effective working methods and tools sustainable in the longer term. The basic structure of the information archive has two main dimensions, #Layers and #Domains. A third important dimension, #Directionality, orients working processes, and is described in a later section of its own. The basic structure of the information archive comprises three main layers. Each layer corresponds to a successively higher level of abstraction (depth) from concrete action, real-world events, and associated knowledge and experience (which would constitute a notional ‘Layer 0’). Content within each layer consists of artefacts, both single and plural, of the appropriate analytical depth: data and databases in Layer 1, documents and document collections in Layer 2, patterns, pattern libraries and pattern sets in Layer 3. Data may be of various forms, formal and informal. They include formal research data such as interview transcripts and recordings, survey data, observational notes and field diaries; less formal data such as initiative/project and event records (e.g. of attendance, membership, activity etc. ); basic maps (without any analytical content); and media of various kinds such as photos, sound and video recordings (unedited), social media posts and similar. Data relate to specific, concrete, real-world activities and events, and so are located in both time and space. They are the most immediate - and therefore most true-to-life - form of documentation of these events. However, production of any form of data involves choices of what to record and how to do so. These choices, whether deliberate, accidental or circumstantial, act as filters between what actually happens and what is recorded. Data production thus begins processes of decontextualisation, simplification, generalisation and abstraction that characterise movement through the main layers of the information archive. Data collection captures, stores and mobilises information, making it available for manipulation (examination, analysis, interpretation, comparison etc.) remote in space and time from the events themselves, including the production of artefacts in Layers 2 and 3. Artefacts in this layer are documents, written and in other formats (e.g. sound, video, animation, multimedia. Whatever the format, they have in common that they deliberately interpose between the data and reader (or listener, watcher etc.) some form of analysis, interpretation and/or abstraction beyond that necessarily involved in the process of data production itself. The depth of this abstraction from data varies greatly: chapters in the ECOLISE book Resilience, Community Action and Societal Transformation range from - at the closest level to data - a first-hand account of experiences of practitioners in a Transition initiative, a summary report of a primary study of Transition in Spain, and a close-to-verbatim write-up of an open space session, to at the other extreme broad-ranging theoretical and conceptual analyses at close to pattern level. Even the most particular in scope at least imply the possibility that the ideas and experiences they report may be of broader and more general relevance: data, in themselves, make no such claim, and this is what distinguishes the layers. Layer 3 comprises knowledge: generalised and potentially mobile conclusions derived from consideration of multiple lines of data and/or sources of information that reveals and makes explicit relationships among them. Its constituent artefacts in all themes are patterns, along with pattern libraries and pattern languages, in the sense originally introduced by Christopher Alexander and now employed in the pattern language and pattern science communities. Patterns in this sense are generic solutions to recurrent problems, adaptable to a wide range of specific situations. Each instance of application of a pattern is unique in detail, reflecting the particular circumstances of its application, though still recognisable as an instance of the pattern. More accurately put, dynamic resolutions of recurrently-occurring conjunctions of different forces. Patterns are thus general (therefore abstract) in nature, and highly mobile. However, they are based on and supported by data, usually via its analysis and interpretation in one or more documents. They are also dynamic in content, requiring constant revision and updating in the light of new data resulting from their application. A pattern language is a set of patterns and their known interconnections (the ‘grammar’ of the language) that collectively constitute the full extent of relevant knowledge in a particular domain of action. A pattern library refers to a set of patterns, usually with some thematic commonality (e.g. on a specific topic), but whose interconnections are not well established: in other words, pathways for navigating among patterns are not well identified. In summary, Figure 2 illustrates the relative general properties of artefacts in each layer. As an aside, the hierarchy of increasing complexity or depth represented by successive layers is easily confused with hierarchies of scope/span and aggregation/number. It may often coincide with these, making confusion even more likely. However, it is conceptually different from both of these and must be carefully distinguished from them if confusion is not to arise. Specifically: Scope or span refers to breadth of coverage within a layer. For example, a database (Layer 1) might be restricted to a particular group or project, a delimited geographical area, or area of thematic interest, or it might be broader in coverage, e.g. include information from different groups, working on different themes, and/or in different places. Both are at the same level of abstraction - that of raw data. It is also worth noting that different datasets might be broad in one respect but narrow in others: e.g. ARTS collected data on all transition actors within specific city-regions - i.e. was broad in thematic scope and narrow in geographical scope - while the International Permaculture Research Survey adopted a very narrow thematic scope and was global in geographical coverage, and TESS data collection was perhaps intermediate in both thematic coverage and geographical scope. An ECOLISE database covering all possible relevant themes in all European countries would have wide scope in both respects, but would nonetheless be at the same level of abstraction. Scope is different from depth, in that increasing depth implies increasing abstraction. For example, an academic report (Layer 2) based on a single case study project or initiative or country is smaller in scope than a database including multiple case studies or with international coverage, but nonetheless has a higher level of analytical depth than either (i.e. it may add depth by drawing on a relatively narrow subset of the scope available in Layer 1). Plurality of artefacts within a layer is different again: aggregating multiple artefacts of the same type does not necessarily imply emergence into another layer. Thus a database is an artefact within Layer 1 whether it covers a single initiative or thousands; similarly, an aggregated database (drawing on data from multiple databases) is simply a plural artefact within this layer (as it does not, in itself, add any depth of analytical abstraction - although it may well make this possible). Similarly, an archive gathering educational resources from different sources is a plural artefact within Level 2; emergence to Level 3 consists of generalising these to different contexts and/or integrating them into novel learning pathways. Increase in depth can be associated with increases in both scope and number. An international comparative analysis, for example, requires access to data from several countries. New, integrated learning pathways can only be created if basic educational materials from multiple sources are available. Such instances invite conceptual conflation, and hence confusion, and so are probably best navigated with more careful attention to distinguishing depth, scope and aggregation. Cross-cutting these layers are several domains, broad categories of information based on key themes in the work of ECOLISE. The current model includes five such domains. Three of these - Research, Education and Practice - show clear fit with the Layers structure. Maps and Media are more tentative; there is a possibility they are better conceived as artefacts within other themes, or a modified model. Domains are not discrete but rather intersect and interconnect. For example: research outputs can inform educational activities and practical action; maps may be both research data and product; documents and patterns produced in the learning and practice domains can also be treated as data or documents in the research domain. 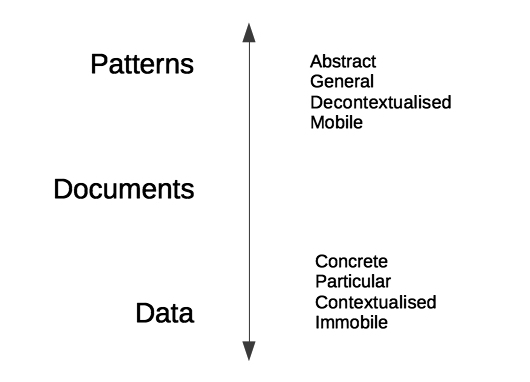 In particular patterns - the most mobile artefacts in the information archive - can often move flexibly across domains. In addition to the possibility of patterns influencing lower layers in other domains, in this layer boundaries between domains are less clear so that a single pattern may occupy more than one theme. Figure 3 represents the basic structure of the information archive as a matrix combining layers and domains. Cells within this matrix represent the basic organisational elements of the information archive. They will accordingly form the main focus of detailed design, based on describing the properties and constituent artefacts of each, identifying their inputs and outputs, and delineating interconnections among them and correspondences with wider needs and capabilities of people in the user community. C2: Analytical and evaluative report on specific events, projects and initiatives: e.g. permaculture design write-ups (including diploma portfolios), project evaluations. E1: Photos, sound and video recordings, social media posts and similar. The key conceptual innovation in this knowledge commons is the systematic use of patterns as a mobile and adaptable form of information artefact. This assumes, and predicts, that epistemological added value derives from the use of patterns - i.e. that patterns enhance the collective capacity of the user community to engage in collaborative knowledge generation. A third important dimension in the information commons is therefore directionality, specifically whether the production of artefacts in Layer 1 and Layer 2 precedes or follows that of patterns in Layer 3. Taking the dimension of directionality into account, we can distinguish two parallel workflows in relation to the information archive. Initial assembly of the information archive is a linear process moving (notionally) from data through documents to patterns. Its ongoing curation and maintenance is a cyclic process, where the patterns themselves contribute to the generation of new data and documents. In the research domain, numerous datasets (Element A1 artefacts) and documents (Element A2 artefacts) already exist, albeit in dispersed and fragmented form. The initial priority is to compile relevant documents, and on this basis begin to develop patterns that summarise key lessons and directly inform production of our own documents. We are currently prototyping this process in relation to production of the EDSC Report, and intend that production of the first Status Report will be the first instance of it full implementation. Production of new research data is beyond our current means. Compilation of existing research data to create Element A1 is an important future goal, again beyond our current capacity. The full knowledge production pathway - from data to information to knowledge - can be represented as the growth of a tree (Figure 4). Roots, representing data, grow directly in the soil of practical action. Roots help nourish the trunk, representing the document collections. Out of the trunk branch patterns of various kinds. The rest of the tree represents the extra steps in the cyclic pathways where patterns contribute to the creation of new documents and data. On the branches grow leaves, that energise further growth of the roots, trunk and branches - i.e. expansion of the information archive - as existence of an initial set of patterns guides compilation and synthesis of further data and documents. Leaves also fall to the ground, mulching, protecting and enriching the soil as they decompose and become part of it. Flowers represent the new possibilities for cross-fertilisation via interchange of patterns across domains, and with different information archives. Fruits are the product of both cross-fertilisation and self-fertilisation, which may themselves fall to the ground and become mulch, act as food for various animals, and contain seeds that may eventually grow into new trees. A major aspiration for the knowledge commons is that it facilitates improved mobilisation of information for action and better processes of collective learning from action. In other words, that the production and use of patterns support practical action, both directly and by stimulating improved processes of data generation and knowledge production. Extending our tree metaphor, leaves (patterns) continually fall to the ground, mulching, protecting and enriching the soil of practice. They also fuel growth in the roots, trunk and branches, both via their effects on practice and directly through photosynthesis and provision of food: patterns strengthen processes of data collection, and production of documents (reports, proposals, policy briefs) that improve document production. 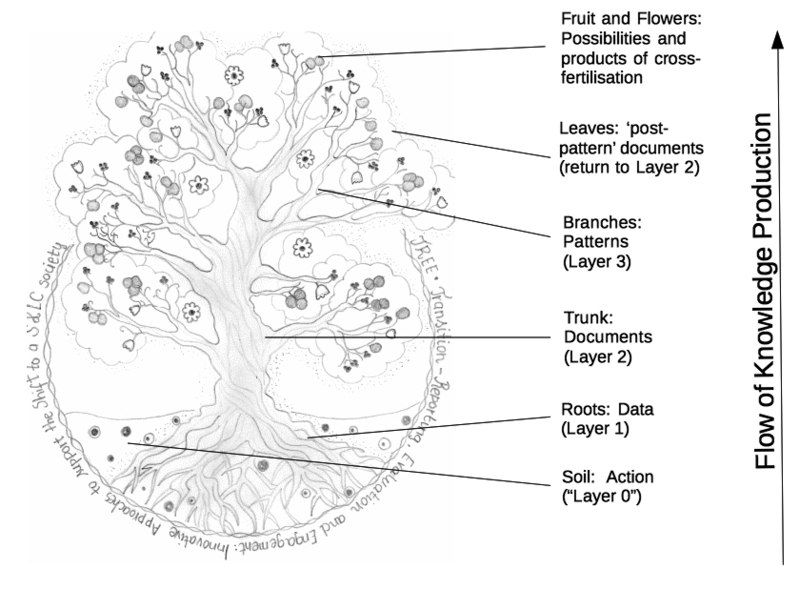 An example of the permaculture principle ‘everything gardens’: like a tree creates a favourable microclimate for its own growth and improves the soil beneath and around it, the knowledge commons supports cyclic processes of knowledge generation. The potential user community for this knowledge commons is vast and diverse: ECOLISE as an organisation, our member organisations and networks, allied and partner organisations in various domains, and a large number of organisations worldwide with overlapping interests, aims and information and knowledge needs. We have not yet defined the scope, boundaries or conditions of participation in the user community working directly on this knowledge commons. Federation allows the effective boundaries of the co-learning community to extend further, operating on an open source basis, patterns in our information archive are available for duplication and modification to anyone else working on a similar basis. Any innovations they make are visible to use and available for us to adopt if we choose to do so. This information archive thus grows not alone, but as part of a forest, a rich and diverse knowledge ecosystem. Visits to flowers by insects and other pollinators allow direct cross-fertilisation of ideas across different knowledge commons. Variation in structure and format among these reflects differences in their emphasis and approach. Some of these are tall trees, some smaller trees or shrubs; some stay close to the soil as ground cover or herby plants, while some climb up the trunks and branches of others. Birds and other animals carry fruits and seeds from one place to another. Within the soil, fungal networks, microbes and small underground animals work productively and invisibly, both supporting and supported by the conspicuous plant growth and animal activity above. 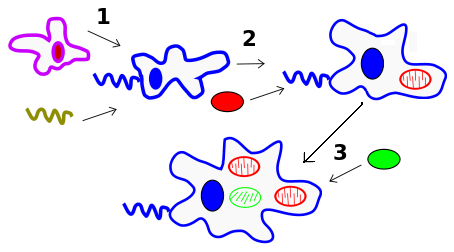 Designs for the three cells in Domain A (Research) follow. Create a general database that can act as a primary research tool, and repository. Allow archiving of research data in a way potentially accessible to organisations, initiatives, researchers and other interested parties, while observing needs for anonymity and confidentiality. Systematic mapping of inputs and outputs at the levels of individual cells and the information archive overall provides a number of benefits. It allows delineation of workflows, identification of organisational needs and associated resourcing requirements, and identification of organisational capacities and associated potential provision of services to both members and third party organisations. Connecting inputs and outputs of cells provides a description of the internal ecology of the information archive. Aggregating inputs and outputs of the matrix overall gives a description of its resourcing needs and what functions/services it can provide; linking these with the needs and resources of potential users gives us a map of its external information ecology and indicates the nature of user and curator communities. Matching inputs and outputs between cells within the matrix defines internal workflows. This allows placement of tasks within workflows and more efficient coordination among tasks, projects and the people executing them. It also allows placement of the outputs of tasks whenever these outputs correspond to the input needs of any cell. The latter provides a possible assessment or evaluation criterion. Whether a task is worth doing might depend on whether and how well it meets those input needs (i.e. whether it produces a harvestable yield). How successfully a task has been completed might also be evaluated in terms of what necessary inputs it yields. Adding together the inputs needed by individual cells that are not among any cell’s outputs gives the aggregate resource input needs for the information archive overall. Some of these may correspond to outputs of member organisations or potential allies or partners, and hence help identify roles for them in the user and curator community. Others that are not readily met through existing activities or capacities comprise the overall resource needs of the information archive. Matching these resource needs against potential outputs provides a basis for evaluating and designing possible new projects. New projects initiated by ECOLISE will have most benefit if they help address these needs; this can also help identify priorities for major flagship ECOLISE-led research projects. Invitations to participate in others’ projects will be of more value and interest the more they help address these needs; this may help decisions about whether to accept such invitations and of specific research activities to suggest/request. When member organisations are devising new projects, matching project outputs to the input needs of the information archive - and the reverse, i.e. making use of the information archive as a resource for the project - provides possible routes towards added value, and towards project activities also contributing to curation of the knowledge commons. The outputs of the information archive are what it offers to potential users and curators, and hence their incentive to collaborate. For example, the value to projects and researchers of a general archiving service incentivises them to provide documents; a PhD or masters researcher may help with identification, archiving and organisation of resources within their research area, improving their own familiarity with the literature and the quality of a research resource of direct utility to them. The list of outputs also defines a list of possible services that it can offer to ECOLISE members, to collaborators outside the network, and to research projects, possibly (in the second and especially third case) on a funded basis. This service provision can be extended to include those offered by member initiatives, whose activities, skills, knowledge and experience are key inputs into Layer 1 across all areas of work. More specialised capabilities developed by member organisations may also be possible parts of such a package - the contributions of Cultivate and the Permaculture Association to the GROW Observatory are an existing example. These rules are currently being developed via an action learning process during production of the 2018 status report and recorded at EcoliseWiki:Policy. The current developer community is the currently active members of the ECOLISE knowledge and learning working group: (Markus Molz, Gil Penha-Lopes, Tom Henfrey), with oversight from Eamon O’Hara. The rest of the ECOLISE secretariat are anticipated to become engaged via use of the information archive as a tool for execution of projects within their remit, particularly written output. MM is currently undertaking extensive consultation with those in relevant roles in ECOLISE member organisations in order to establish the future membership, structure, goals and working processes of this group. This is likely to include interest in using and contribution to development and curation of the knowledge commons. There is possible overlap between development of the Knowledge Commons and the recently-started Information for Action on Climate Change project (I4A) led by the Permaculture Association. TH and GPL are on the project team, Gil with responsibility for assessing the scientific credibility of permaculture-based climate change responses and Tom for coordinating development of a pattern language based on the findings. It is possible that these resources could become part of the wider ECOLISE-created knowledge commons, and the patterns developed and associated documentation being both shared within this commons and available as a standalone resource. Whether this can be done in a way consistent with the aims of I4A has yet to be determined. If so, it provides a possible model for integrating existing projects and developing new ones within the wider framework of the knowledge commons, contributing to development of the latter and maximising its utility to specific projects. This general principle of finding synergies with the needs of specific projects and capacities of those working on them is a vital part of establishing a user and curator community able to maintain the knowledge commons on an ongoing basis without creating excessive new demand for resources. Users will be incentivised both if the knowledge commons is useful to them as a tool and if the tasks involved in contributing to its maintenance are also of directly interest and value to them. One possible model for this is themed groups of people interested and working on particular subject areas, who contribute to compilation of information and production and revision of patterns in that area. Sustained leadership and energy for such a theme group could come from a PhD student or other individual or group with a long-term commitment to a particular subject area, whose work would directly benefit from being a core member of a learning community and coordinating collaborative knowledge production in their area. Jo Hamilton, a TRN coordinator who is doing a PhD on psychological dimensions of climate change activism, with Inner Transition as a major research topic, has expressed an interest in holding this theme. GPL and a PhD student, Pedro, are providing research support to the Transition Municipalities project, and open to taking this role in this subject area. Both provide opportunities to pilot facilitation of user communities at this level. It may make sense also to be proactive in establishing them within other core areas of research interest (e.g. monitoring and evaluation, enterprise and economy) if appropriate skills and interest are available. What interests, expertise, time and energy are available for such tasks can be explored during establishment of the user community. Figure 6 shows a preliminary organisational model of the user community (initially developed for Transition Research Network) as a social application of permaculture zoning. It identifies realistic and mutually beneficial contributions of collaborators in different circumstances, with very different levels of capacity and interest to contribute. This page was last edited on 13 November 2018, at 11:02.